After months of preparation, the joint Iraqi Armed Forces/Kurdish peshmerga offensive against the Islamic State-held city of Mosul has begun in earnest. Following an official announcement from Iraqi Prime Minister Haidar al-Abadi, the first stages of the offensive began Monday morning1. For several months leading up to the announcement of the operation, the IAF had been gathering soldiers, supplies, and armor in the Makhmour region of Iraq, using Kurdish Regional Government (KRG) territory as a staging point for mobilization2. After a night of heavy Operation Inherent Resolve (OIR) coalition airstrikes and artillery bombardment on multiple fronts, the first assaults began at dawn on October 17th. Multiple announcements about the operation were made, and the fighting began in earnest that morning3. A day 1 map of advances and captures near Mosul. Initial reports indicated that 60,000 Iraqi Security Force (ISF) soldiers were participating in the offensive, including 6-9,000 KRG peshmerga and a further 10,000 fighters from the Hash’d al-Shaabi (Popular Mobilization Units)4. Iraqi intelligence reported that the number of Islamic State militants defending Mosul and the surrounding area was around 8,000, but other sources report the number to be anywhere from 3-9,0005. Despite the lack of clarity on exact numbers, as the morning of the 17th dawned it became quite clear that IS forces were outnumbered and outgunned. Live footage from Kurdistan24 TV news showed T-55 and T-62 tanks, MT-LB and Cougar-H personnel carriers, and dozens of HMMWVs (Humvees) and up-armored technical vehicles6,7. Other images received from the frontline showcased a wide array of troop transports and armored vehicles, many of them recently purchased from Western armament companies. 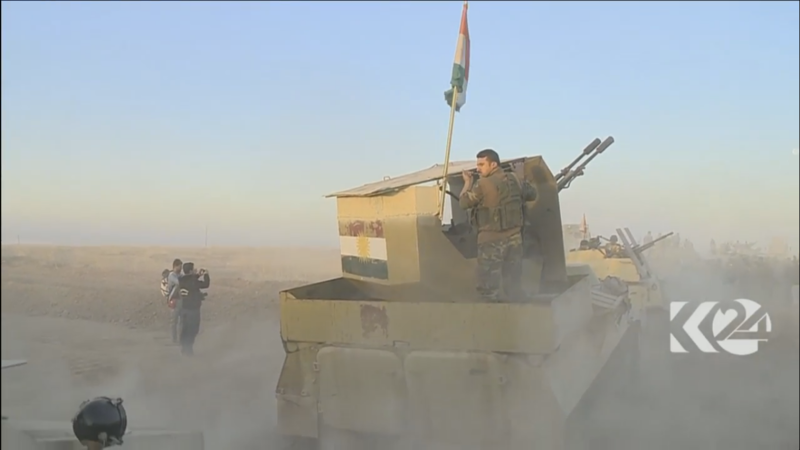 A peshmerga MT-LB transport vehicle awaits orders near Bashiqa. The first victory of the day went to the KRG peshmerga forces, who seized the town of Bashiqa before dawn and repelled an attempted counteroffensive by IS fighters8. As the capture of Bashiqa was confirmed by news reports9, peshmerga forces launched a multi-pronged offensive into the southeastern countryside of Mosul and Barthoula Districts, assaulting and overrunning rural IS positions. 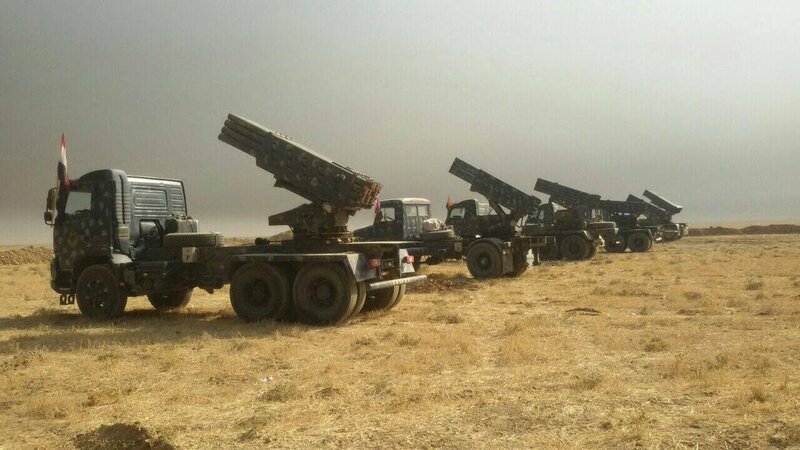 IS struck back, however, launching several suicide vehicles (SVBIEDs) towards peshmerga and ISF lines as the day’s battles raged on10. The peshmerga offensive stopped short of the major towns of Barthoula and Bakhdadi, as resistance by entrenched IS fighters cost significant casualties11. Reports on casualties could not be independently confirmed, but both sides claimed that their opponents had suffered heavily in the fighting. 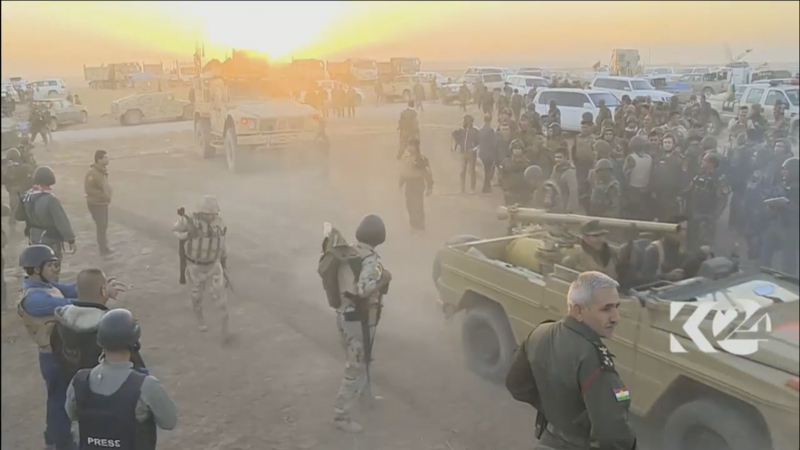 Livestream of fighting near Barthoula town, image courtesy of Kurdistan24 TV. 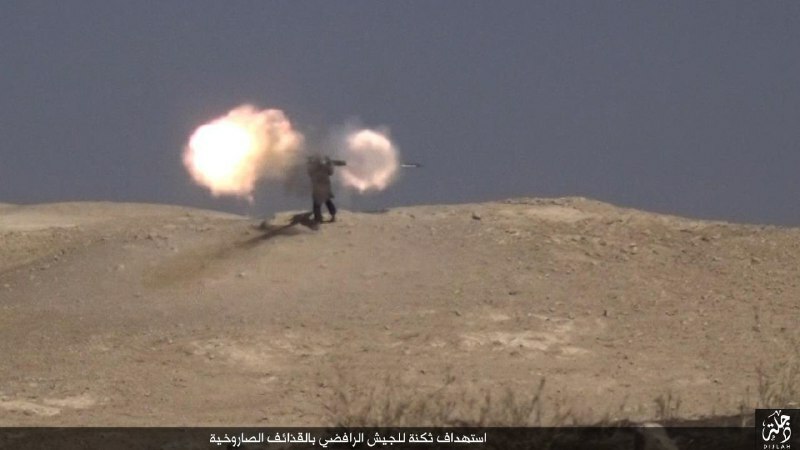 Farther to the south, the ISF forces stationed in Makhour launched major attacks towards the north as Hash’d al-Shaabi fighters engaged IS near Shirqat and in the Makhoul Mountains, aided by rocket artillery12. IS and Hash’d fighters skirmished for much of the day, with no major gains or losses in territory13. The bulk of the fighting occurred to the north of Qayyarah and Shirqat, as ISF units advanced en masse towards the town of Hammam al-Alil. Despite several suicide attacks, IS was unable to reverse the gains that the ISF made, and before evening the Iraqi flag was raised over Hammam al-Alil and control of the surrounding area was made imminent14. Fighting continued in the rural desert surrounding the town, but control of the immediate area was restored and ISF artillery immediately began pounding opposing positions in order to soften defenses for the next day. Later in the day, before dusk, IS units withdrew from Balawat town, and Balawat and the surrounding area were secured by ISF vanguard soldiers15. Hash’d al-Shaabi fighters in combat close to Shirqat. After the first day of action, it is clear that the Islamic State is fighting a losing battle. Outnumbered and outgunned, and facing a large chunk of the OIR coalition’s airforce in Iraq, their fight will be a significant struggle that will cost them heavily. Although OIR activity on the 17th was limited in scope, F-15 and F-16 planes were still in the air, targeting IS positions throughout northern Iraq16. Leaflets were also dropped on civilian neighborhoods in Mosul, urging locals to barricade their homes and shut off gas and electricity when fighting drew near17. Despite these attempts at helping civilians, there are concerns that the suffering of noncombatants will be exacerbated not only by upcoming winter weather conditions, but also by resistance from the IS fighters remaining in Mosul. Unsubstantiated reports from within the city indicate that IS is attempting to prevent civilians from leaving, and the UN Office for the Coordination of Humanitarian Affairs (OCHA) has crafted a report outlining their concerns for refugees and noncombatants during the operation18. Despite these concerns, the offensive appears to be continuing without delay. Each day will likely see new advances by the ISF and peshmerga as the Islamic State crumbles under a multi-front offensive, but these advances will come at a cost in men and materials. The battle for Mosul itself draws nearer with each metre gained.